Getting the work-life balance right can be tricky, but have you ever been so exhausted you’ve nodded off at your desk, in a meeting or even on the phone? According to a new survey carried out on behalf of Memory Foam Warehouse, nearly half of us have done just that – and two-thirds were caught in the act. The poll found that 47% of people admit to dropping off at some point in their working lives, with most of these saying the experience lasted five minutes or less – although 8% said they’d napped longer than 10 minutes. If this sounds surprising, consider how many of us get the recommended seven full hours of sleep every night: according to the survey, a massive 72% of us get by on less. This is despite the fact that most respondents seemed to be aware of the value of a good night’s sleep. 86% of those polled said they often feel they need more sleep than they currently get, and 47% say they’re less productive at work when they’re tired. Additionally, 29% of people would like to see sleeping facilities in their workplace where employees can catch up on some much-needed rest. 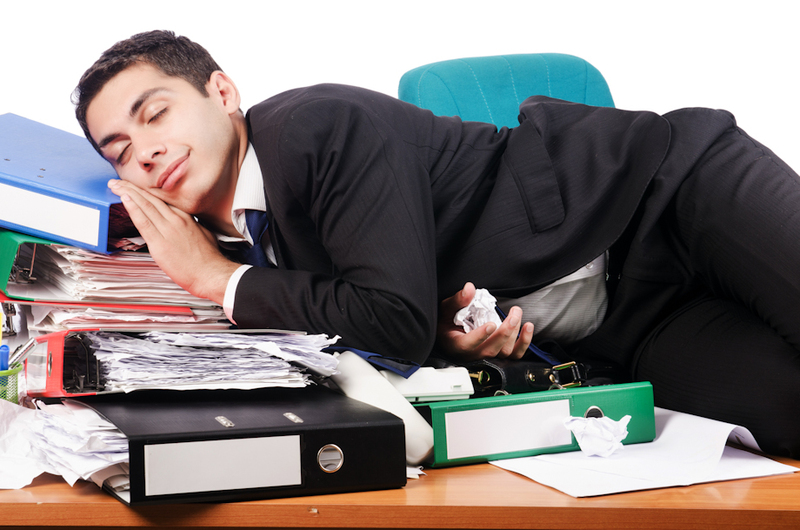 All this napping doesn’t go undetected, either: 10% of those caught snoozing on the job were rumbled by their bosses, although a luckier 34% were nudged awake by a colleague instead. The commute to work also seems to be a popular time to catch up on some shut-eye, with 31% of people saying they sometimes sleep on the bus, train or tube – at least, we hope they’re not napping behind the wheel! Out of the English cities surveyed, people in Nottingham came up as the most in need of sleep, with 84% of respondents in this city saying they get less than seven hours a night. However, at 57% it was people in Birmingham who were most prone to dozing off at work, closely followed by Londoners at 54%. Participants were also asked where they tend to do their sleeping at work – the most common answer was at their desk, although a considerable number of people manage to drop off while on the toilet! Lisa, aged 44, who works as an office assistant, said she finds herself falling asleep when left to herself in the office, despite feeling that it’s unprofessional. “It isn’t usually the company’s fault though that an employee is tired – it’s usually down to outside circumstances in my opinion,” she added. There is an even more serious side to the nation’s sleeplessness, with recent reports showing a huge rise in type 2 diabetes among UK adults – a disease associated, among other things, with inadequate sleep. Doctors and health experts are continually raising concerns about the amount of sleep people get in the modern world. Dr Peter Venn, Clinical Director of the Sleep Disorder Centre at the Queen Victoria Hospital in West Sussex, said we live in a “driven, high-performance society” in which people are often tempted to supplement real sleep with stimulants. He added that it is important to look at both the quality and the quantity of sleep people are getting. Dr Rahul Mukherjee, Consultant Respiratory and Sleep Physician at Birmingham Heartlands Hospital, pointed to a 2007 study showing that people who sleep for five, rather than seven hours a night nearly double their risk of death from all causes, particularly cardiovascular disease. “Lack of sleep seems to be related to an increase in hunger and appetite, and almost certainly to obesity. Not only does sleep loss appear to stimulate appetite, it also stimulates cravings for high-fat, high-carbohydrate foods,” he added.